As beer barons Guy Greenstone and Steve Jeffares sign off on another GABS, they also announce the passing of the baton at their beloved Local Taphouse Darlinghurst to the brothers Thorpe. Victorians Greenstone and Jeffares opened their northern instalment of The Local Taphouse in 2009, expanding upon their St Kilda stalwart by the same name opened in 2008, and kick-starting what would become one of Sydney’s favourite specialised beer houses. Proudly championing new brews and emerging styles, The Local has pumped over 2,000 brews through its 60 taps, spread over three levels. Both the St Kilda and Darlinghurst venues have led the success of the Great Australian Beer SpecTAPular (GABS), which has become one of the world’s great events on the appreciation of beer. 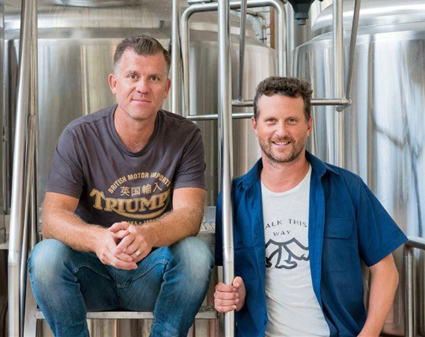 Greenstone and Jeffares have also launched their own brewery, Stomping Ground Brewing Co, which they report has “taken off much faster than we expected”. These unbridled successes brought about the reluctant listing of the NSW pub, Jeffares saying at the time they were eager to sell to someone similarly passionate about beer. Answering their prayers are brothers James and Josh Thorpe, taking their combined 12 years’ experience working in and managing pubs to the next level, becoming first-time owners. The agreements freshly signed, Greenstone invited the Thorpes to last weekend’s Sydney GABS as their guest, and says there’s still some celebrating to do at The Local. “I got to meet them – they’re really nice guys,” said Greenstone. “They’re committed to the craft industry and beer, and seem to really know their stuff. They’re young, full of energy, and going to be great custodians of the Taphouse. Greenstone tips the hand-on style the Thorpes will bring, which they could not from Victoria, will benefit the operation. Speaking to PubTIC, James Thorpe says they have plans to tweak the name to simply ‘The Taphouse’ and delve deeper into a connection with Australian ‘craft’ spirits, but these things will come in time. “The venue is not broken, by any means!” says James. “We want to hit the ground running and operate it as-is for a while. We have some money earmarked for renovation. The leasehold interest of The Local, situated on historic Flinders Street between Oxford Street’s Taylor Square and the Sydney Cricket Ground, was marketed by Ray White Hotels’ Blake Edwards. “The current low interest rate environment has increased demand and consequently the capital values of freehold hotels so much now that the entry point for a Sydney Metropolitan Hotel is out of reach for many purchasers.